So today I went down the rabbit hole know as YouTube and ended up on a video that inspired an idea. The video that I somehow stumbled upon was one where some guy made the EV charger for his Tesla have a Flux Capacitor on the top of it. Seeing this video got me to thinking how I could create a Back to The Future inspired video where the “Hero car” was a modern Tesla instead of a Delorian. While the flux capacitor would play a key role in the video, it would not make the car into a time machine. This is where I start to stumble, I can not think of a modern day problem (besides time travel) that a Telsa equipped with a flux capacitor could accomplish. Since there are no roads in Canada where you can legally drive at 88 mph (142 Km/h), the supper power of the flux capacitor on a Tesla in Toronto would activate at 88 Km/h, so the road would have to be the Don Valley Parkway or a 400 series highway (that is when you can get up to that speed on one of those in Toronto). I am still stuck on what that super power will be if it is not time travel. I am leaning toward something to do with the environmental impact of the Tesla, but something fun to watch and is not all doom and gloom. I want to make an impact on people without them knowing that they are watching a video about being environmentally friendly. One idea is to have the Tesla driving driving up the DVP at slow traffic speed, then once on the 404, the flux capacitor is turned on and a second person is in the car and the Tesla moves over to the HOV lane and gets up to highway speeds and passes all the single passenger vehicle in the slow lanes. When it reaches 88km/h, the magic happens and now the traffic is stopped on all the other lanes and the Tesla just keeps passing these stopped cars. Hey, that is just one idea! 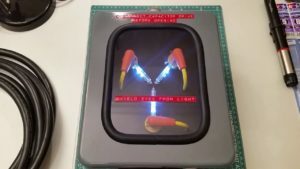 Enter you, the people reading my post, I need your ideas of some real world scenarios of what a flux capacitor can do when the Telsla reaches 88 Km/h? But remember, I want the video to have a realistic impact about the enviro aspects of electric cars, without being preachy about the environment.